This is the second soup we made for the Halloween party and it makes a big, crowd-pleasing portion of soup (leftovers freeze well, I'd guess, though I didn't have any!). I like a rich, flavorful chili with more beans and tomatoes than meat. I adapted a recipe from Smitten Kitchen and loved the final product. This would be easy to put together in the crockpot for a nice dinner ready after work, or just cooked on the stove in a dutch oven and held in the oven until ready to eat. Use whatever beans you have on hand and watch this chili disappear (don't forget to add corn, like I did!). Happy Halloween! Place a large Dutch oven or saucepan over medium-high heat. Add the beef and cook until browned, about 5 or 10 minutes. Add the onion, stirring well, and cook until translucent, about 10 minutes. Add the garlic and cook 1 minute more. Gradually add the broth, scraping up any browned bits from the bottom of the Dutch oven. Stir in the chili powder, cumin, cocoa, tomatoes, tomato sauce, and green chilies. Reduce heat to medium-low, cover, and let simmer for 10 minutes. Add the beans, salt, and vinegar, stirring well. Simmer uncovered for 10 minutes more. Adjust flavor with your spices of choice. Stir in the frozen corn and garnish with the cilantro, Cheddar, sour cream, and jalapeno, if desired. Serve hot in a bread bowl or with cornbread. One of my favorite throw-it-together meals. I never even follow a recipe. Love the corn addition and the chili looks so good. I agree, more beans and tomatoes, less meat. Have you ever just put ground turkey in without telling your husband and seeing if he notices. Mine wouldn't. Or use the 93% lean beef, you can't even tell--maybe in a burger, but not in a chili! Hi Ann! 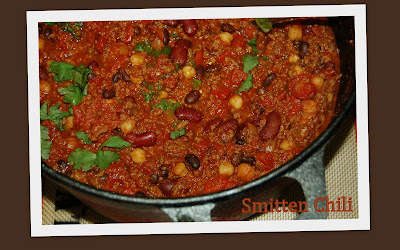 I sure love chili, I followed you from a friends blog = ) This is fabulous... the more beans the better... YUM.. so delish! That sounds like a great chili! This looks delicious! I love chili, and it's great to see how many different versions there are! This looks great! I just can't get enough of chili this time of year. Ha -- funny, I always think that I can trick 'em with the turkey and they'll never know, but they always do! Oh well, it's not as big of a deal now that very lean ground beef is readily available! Perfect Halloween dinner! I think I'll try half and half turkey and beef next time (and work on changing his palate!). I try to buy the super lean beef and freeze it whenever it's on sale. Wow, 1/3 cup of chili powder. That's gotta be good! Wow! What a fabulous recipe and perfect for Halloween! I've been looking for a good chili recipe. I love your blog, by the way and I'll be back soon! That looks delicious! I have a chili problem... as in, I can't get enough. I'll have to give this a try!